"Eliminator" is the second full-length release by Suction's own full-time robot, Gregory de Rocher. While previous Lowfish efforts have regularly hinted at electro, Eliminator's 10 tracks positively boom. But there's a twist to these punishing drum computer workouts. This is after all a Suction record, so it's fairly safe to assume the DJs are going to find it a little weird. Rarely have pounding 808 beats been cut with such intricate detail and stark, arresting melodies. "Eliminator" finds Lowfish locked away for months in the studio with just an 808, a couple of synths and a pile of rotten FX units, searching for that "perfect melody." He decided to get rid of the sampler, opting instead for an eight-output soundcard for his computer. 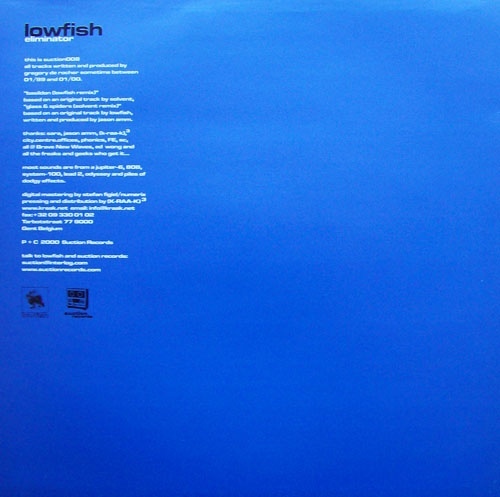 "Multiple tracks" says Lowfish, "means more 808 parts." You may call him a bit of a purist. 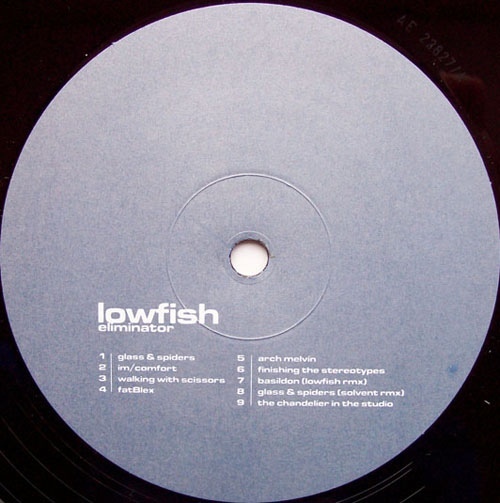 Lowfish makes no secret of his influences, which include '70's modular-murk (Roedelius and Tangerine Dream), '80s electro-pop (OMD, New Order and The Art of Noise), crunchy techno (early Warp and Rephlex) and freaky new school electro (Den Hagg and Detroit). He manages to combine these diverse strains of electronic music history into a sound that is completely natural, utterly timeless and totally Lowfish. This release also marks the first time Suction's two full-time robots have taken on each others' tracks, featuring Lowfish remixing a Solvent track ("Basildon," from Solvent's 1999 full-length) and Solvent remixing a Lowfish track ("Glass & Spiders," which is featured on this album). With "Eliminator," Lowfish delivers everything a Suction robot could hope for; fierce electro beats, fat basslines, warm analog production and catchy memorable melodies. Robot Music From Canada.